The Minnesota Vikings are off to a disappointing 1-2-1 start. After starting off with a hard-fought win in week one against the San Francisco 49ers, things have been going south for Kirk Cousins & company. With the Vikings on a two-game losing streak, the hole they’ve dug themselves into seems to be getting deeper and deeper. After a brilliant 13-3 record in 2017, the Vikings aimed to keep their success going. After Case Keenum left Minnesota to sign with the Denver Broncos, the Vikings brought in Cousins in an effort to further their Super Bowl aspirations. When the Vikings signed Cousins, it became clear that the Vikings would enter this season as strong playoff contenders. So far it’s been the complete opposite of their expectations. Cousins is currently ranked third in the league in passing yards with nearly 1,400 and he’s thrown ten touchdowns and two interceptions. The Vikings’ signal-caller is connecting well with Adam Thielen and Stefon Diggs as they have combined 784-receiving yards. The crack in the Vikings, however, is the running game. Minnesota’s running game is last in the league with only 252-rushing-yards. Dalvin Cook is currently dealing with a hamstring injury and Latvius Murray has been silent. The Vikings only have 68 rushing yards in their last two games. So far this season, no Viking has rushed for at least 45 yards in a game, the highest being 42, which was by Murray in week one against San Francisco. 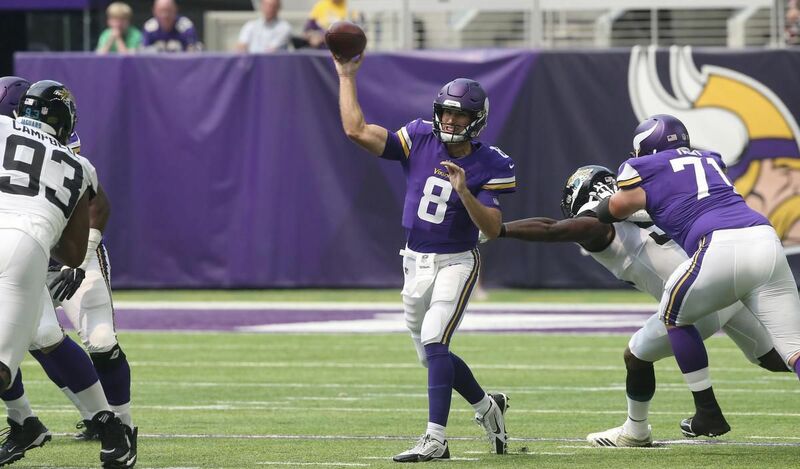 Minnesota’s running game must pick up the pace immediately as a way to balance out their offense and take some of the pressure off the newly acquired Cousins. The Vikings defense has been getting torched to put it lightly. Minnesota has allowed 27 points or more in three games so far this season. Last season, that only happened twice. The Vikings’ defense’s allowing an average of 382 total yards of offense, putting them 21st in the league. Minnesota is second in the league in fumble recoveries, but 24th in interceptions with only two. Overall the defense looks to be lost and confused Passing defense needs to improve coverage, create pressure and most importantly, they must force turnovers. Overall, the Vikings aren’t a balanced team. They need a team that can excel on both sides of the ball. Mike Zimmer’s team are taking on the Eagles this Sunday. Minnesota is now in a must-win situation if they are to save their season and still be in contention for the NFC North title. There’s plenty of football left, but there’s no more time to waste. This article was originally published here at Unfiltered Access.